This home in the village of Fairhaven gazes over the area’s longest beach and an open sea that stretches all the way to Antarctica. 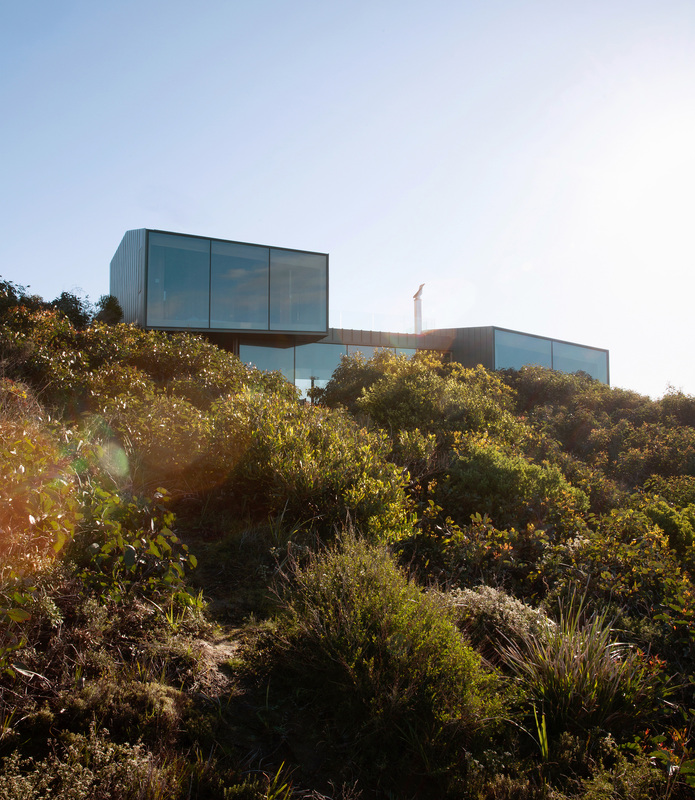 The house that architect John Wardle designed for a couple in coastal Fairhaven, Australia, twists and bends to comply with local laws that prevent buildings from disrupting the ridgeline views from the Great Ocean Road. Refusing to fixate on the seascape at the expense of other views, Wardle oriented the living room to a lush grove of trees. A yellow Bend sofa and two Husk chairs, both by Patricia Urquiola for B&B Italia, add splashes of color. The rooftop terrace is furnished with a Tropicalia chair and chaise longue, designed by Urquiola for Moroso, and a Jil table by Justin Hutchinson for Tait Outdoor. 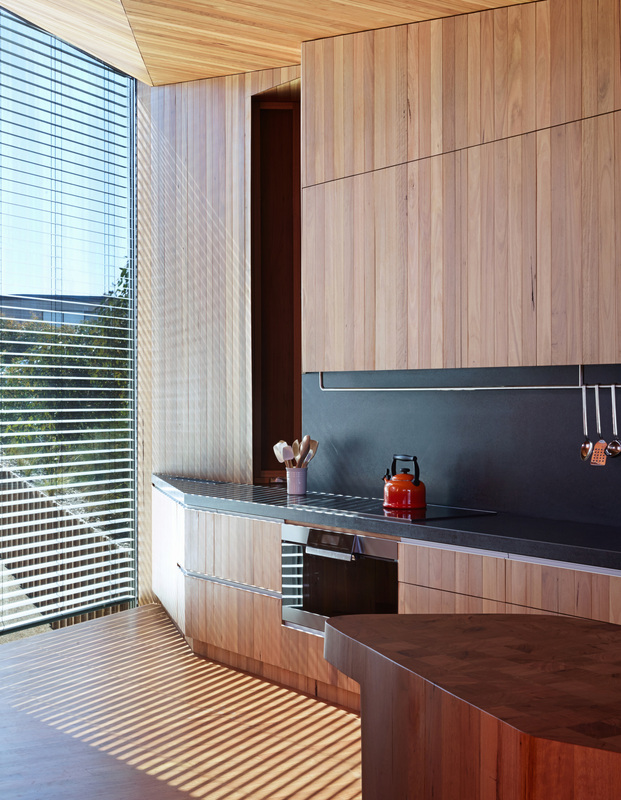 Wardle’s firm also designed the dining table, where up to ten guests can gaze out at the Southern Ocean. The solid-oak Hiroshima chairs are designed by Maruni. The couple, both surfers and beach lovers, wake up to stunning views of the azure-blue Southern Ocean in their otherwise monochromatic eucalyptus master bedroom. Wardle’s firm designed the bed base, and the panel in the ceiling hides a television. A sliding window between the kitchen and the barbecue area makes outdoor cooking a cinch. “In summer, we eat out there a fair amount,” the wife says. Wardle chose zinc for the exterior to complement the trees that surround the house on its northern fringes. In the state of Victoria, Australia, the Great Ocean Road snakes along the Southern Ocean coast, skirting the edges of cliffs that drop sharply to the pounding surf. The village of Fairhaven gazes over the area’s longest beach and an open sea that stretches all the way to Antarctica. When they first saw the lot that would become their home, there was a For Sale sign out front but no one around. “We walked through the vegetation, making a path to the edge of the cliff,” the husband says. “The first time we saw that view, we knew we had to live here,” he adds, gesturing toward the sweeping ocean as seen from the dining room window. “It’s one of the great challenges of building on the Victorian coast,” he adds. “The views are to the south, but the sun is to the north.” So he designed the house “to bring in the northern sun and compress it.” To comply with local planning requirements, Wardle had to tug down the corners of rooms and compact parts of the roof to make sure the house didn’t break the ridgeline view from the road. But that constraint turned into a feature. “Whatever strategy we used on the outside of the house, the same experience is converted to the inside,” Wardle says. “The interior and exterior profiling match exactly, every crimp and contortion—hence the experience of moments of compression and moments of release.” This effect is most dramatic in the corridor that leads from the front door to the main living area. The hall slants and curves, keeping visitors tightly bound, until it opens suddenly into the glass-fronted expanse of the wood-wrapped lounge room. Ceilings, floors, and walls throughout the living area and bedrooms are wrapped in blackbutt eucalyptus. The dining table, which seats ten, is Victorian ash, the dining chairs European oak. Wardle’s office designed the dining table as well as a coffee table and an end-grain butcher block in the kitchen. The wife likes to bring a stool up from the wine cellar and tuck it under the block so she can work on her laptop while her husband cooks. Beyond the striking main living area, the house is full of little nooks—private places in the sun or sheltered from the Southern Ocean wind. The wife often sits on an upstairs patio near the master bedroom, or in the study. She uses the study for work but often finds herself stretched out on a cream-upholstered Bohemian chair, which Urquiola also designed, “like a lizard on a rock.” Her husband, meanwhile, can often be found on the bed, just looking out the window. The couple were keen to maintain the property’s pristine vegetation and for the house to blend into the landscape. The trees had only recently recovered from a severe bushfire, and, as the wife explains, “around here, things take a hundred years to flourish. You want to keep as much of what already exists as you can because it’s so difficult to grow more.” So Wardle’s team designed the house to cover less than half the permitted building footprint. A cantilevered second floor means less vegetation had to be disturbed, and the native eucalyptus trees are reflected in the zinc cladding that covers the home’s exterior, matching the trees’ green-gray foliage. The wife says the house has proved to be brilliantly functional as well as beautiful.